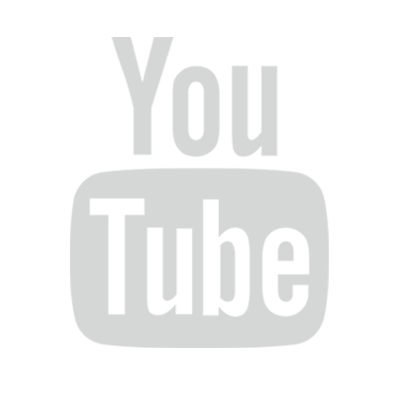 In addition to hosting annual conferences or regional meetings, CICADA sponsors periodic guest speakers who address the research themes and preoccupations of the centre. Some of these speaking events are featured below. 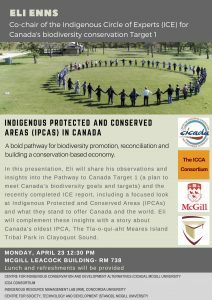 Eli Enns, Co-Chair of the Indigenous Circle of Experts (ICE) for Canada’s biodiversity conservation Target 1, delivers the talk: “Indigenous Protected and Conserved Areas (IPCC) in Canada: A bold pathway for biodiversity promotion, reconciliation and building a conservation-based economy.” In this presentation, Eli shares his observations and insights into the Pathway to Canada Target 1 (a plan to meet Canada’s biodiversity goals and targets) and the recently completed ICE report, including a focused look at Indigenous Protected and Conserved Areas (IPCAs) and what they stand to offer Canada and the world. 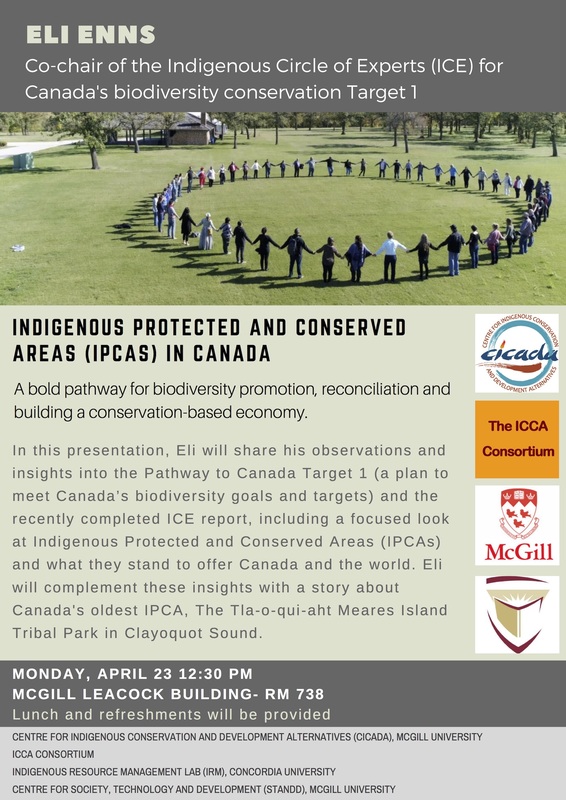 Eli complements these insights with a story about Canada’s oldest IPCA, The Tla-o-qui-aht Meares Island Tribal Park in Clayoquot Sound. 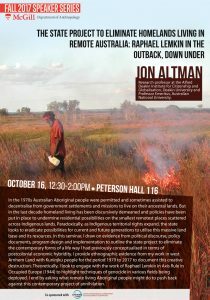 Professor Jon Altman (Alfred Deakin Institute, Deakin University, and RegNet, Australian National University) delivers the lecture, “Genocide and Intervention in Contemporary Indigenous Australia: Raphael Lemkin Down Under.” In the 1970s Australian Aboriginal people were permitted and sometimes assisted to decentralize from government settlements and missions to live on their ancestral lands. But in the last decade, homeland living has been discursively demeaned and policies have been put in place to undermine residential possibilities on the smallest remote places scattered across Indigenous lands. Paradoxically, as indigenous territorial rights expand, the state looks to eradicate possibilities for current and future generations to utilize this massive land base and its resources. 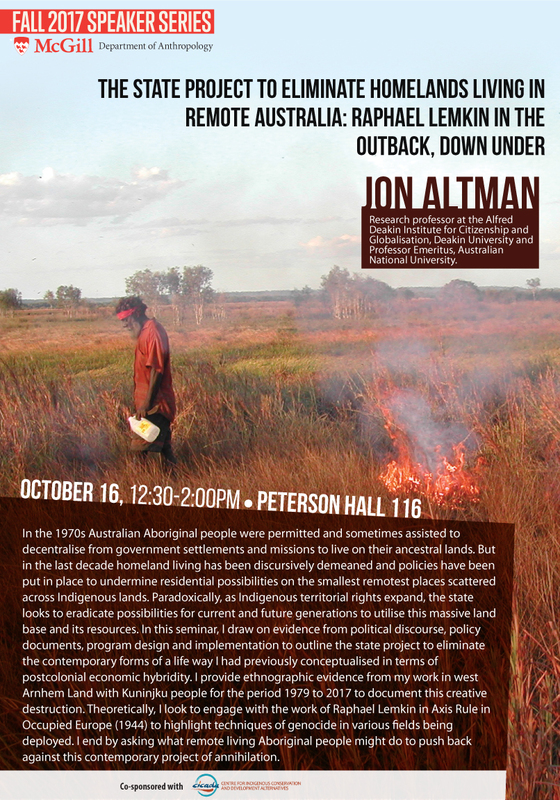 In this seminar, Prof. Altman draws on evidence from political discourse, policy documents, program design and implementation to outline the state project to eliminate the contemporary forms of a life way he had previously conceptualized in terms of postcolonial economic hybridity. He provides ethnographic evidence from his work in west Arnhem Land with Kuninjku people for the period of 1979 to 2017 to document this creative destruction. Theoretically, he looks to engage with the work of Raphael Lemkin in Axis Rule in Occupied Europe (1944) to highlight techniques of genocide in various fields being deployed. He ends by asking what remote living Aboriginal people might do to push back against this contemporary project of annihilation.